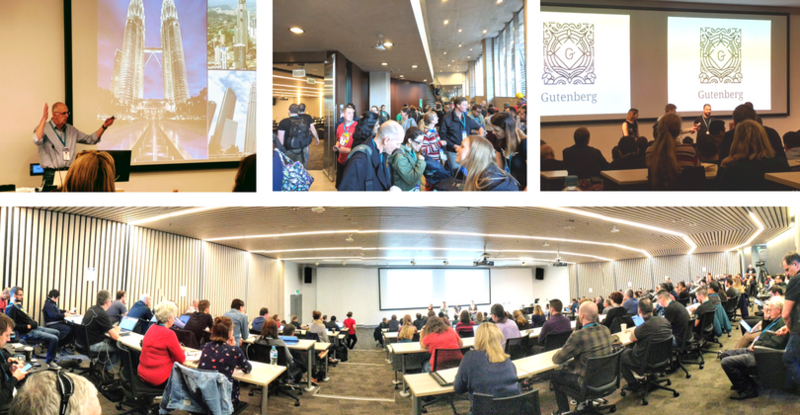 As a Silver Sponsor, we’re proud to have contributed to the event, and we want to thank the Speakers for sharing their insights, ideas and all the value attendees got out of the many sessions over the two days. I was able to leave the WP Hosting stall to attend a number of talks, and at times, it was a struggle to decide which of the two running concurrently to attend. Luckily, all talks were recorded and will be available soon on WordPress.tv, so you cancel your Netflix subscription now. 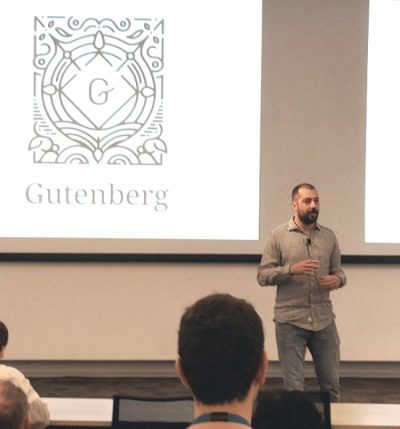 Luke Carbis’ keynote, The Future of Web Content, was an opportunity to see Gutenberg in action and get the lowdown from someone closely involved in its development. He showed us how the new editor worked and explained that the project was driven by the desire to replace a legacy editor with one that would ‘leapfrog the competition’. Luke was also part of the panel for the Gutenberg and General Q&A on Day 2, alongside Robert Anderson, Cath Hughes and Dee Teal. Apart from the what, why and when questions, many of us wanted to know how Gutenberg would play with existing page builders. There was no definitive answer to this as much depends on how they decide to implement the new editor, if at all. The only ‘controversy’, if you can call it that, was when it was suggested that people use soft breaks to ensure multiple paragraphs remain in the same block, but Komala clarified on Twitter that the Classic Block will handle this without polluting the element with <br>s. Gutenberg will start appearing in our dashboards with WordPress 4.9.8 (which was released a few days ago). On the non-Gutenberg front, talks were just as interesting. It was great to deep dive into troubleshooting WordPress, and the tools you need for that, during Alex Bishop’s Debugging WordPress with xDebug talk. 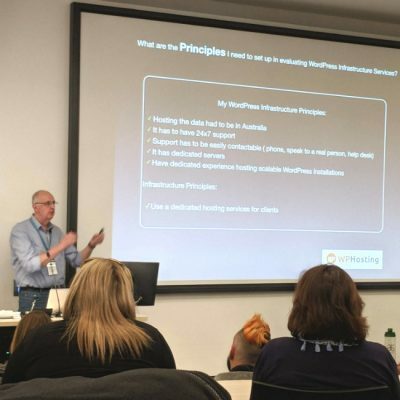 I now have a better understanding of what the support team here at WP Hosting do to help clients make their websites run fast. 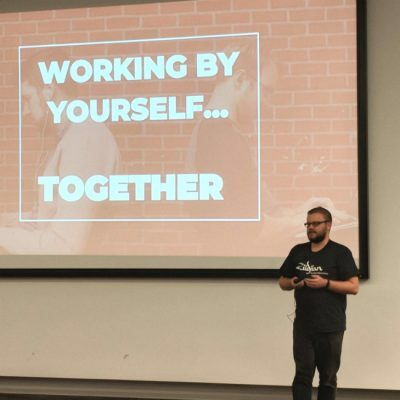 Freelance devs and solopreneurs would have appreciated Robey Lawrence’s (aka the Bearded Friend) talk on working solo and what you can do to mingle and network. He’s also one of the bosses at WP Bosses podcast – WordPress Interviews & News From Around Australia. You’ll find an interview with Luke Carbis there too. Dee Teal reminded us that the Client is Not Your Enemy and offered many pointers on how best to manage projects and expectations, and that “it’s important to set boundaries”. Bryant’s WordPress Plugin Development for Developers and Business Owners talk was an eye opener, I now have a better appreciation of how plugin developers work, as well as the commercial opportunities and risks are. One talk that I missed, unfortunately, was James Rose’s advising us on Getting content from clients on time. James is helping agencies and freelance developers save a ton of time and hassles by streamlining the content gathering and chasing up process via Content Snare. I had the opportunity to talk to him during one of the breaks and follow up on some of the items he talked about in our interview with him. Honourable mention goes to Chris Mundy of yourwebpresence, who was one of the speakers. 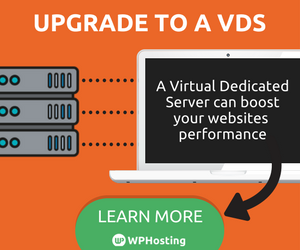 He made a point that clients should be hosted on dedicated servers for performance. We’re very appreciative and happy to have been featured by Chris in his presentation. We’ve been working with Chris a while now — you can read up more about what he does in our Spotlight. A Sydney based designer/art director, website developer and artist with more than 25 years design experience and 12 years building websites. It was fascinating to learn about her background in art direction, working in agency land, and how she currently helps SMEs with design, branding and web development. It was a pleasure catching up with elusive David Forshaw of 4sure Online. I’ve been trying to feature him and his business in our Partner Spotlight for a couple of months now, but he’s been too busy with work, or so he says. David is based in Brisbane. Oftentimes, when I notice some awesome websites in our CRM… he’s the person responsible, including the Carers Queensland, West End Magazine and many more. I hope he could share some of his secrets here on the blog one of these days, or I will have to chase him up at WordCamp Brisbane this coming October. Yep, a new WordCamp is happening real soon! It’s fair to say that the people and the vibe made the event as much as the content successful. It felt great to chat with people and learn what they’re doing with WordPress. And help them with their WordPress issues too: Longping Liu, feel free to email me about your Beaver Builder issues that we tried to troubleshoot together. I’ll ask one of the devs here to have a look. It’s a solid product that punches well above its weight and has a big advantage over SaaS alternatives as it runs natively within WordPress. Best of all, it’s 100% Australian. I can mention many more people and conversations but instead, I will end with a quote which captures how I feel about #WCSyd. Had an amazing time at #WCSyd learnt a lot and most importantly, met some absolutely amazing and inspiring people. I arrived knowing nobody and left feeling like I’m part of an amazing community I hardly knew existed. Thanks to everyone for being so welcoming, you’re all awesome! Did you attend? There is still time to win an iPad! All you need to do is find five of these cute WCSyd mascots — — hidden around our website. Please note: This competition is only open to those that bought a ticket to the event.